So, this one time, back in July of 2010, I bought this fabric and started a quilt. I worked on it in spurts, and it just sort of languished around in my sewing room. Well, earlier this year, my cousin announced that she and her family that consisted of her, her husband and two boys were expecting a little girl! I wanted to make something for her, but I wasn’t sure what at first. Then I thought back to my WIP pile and thought, “I should totally finish that quilt and send it to Linda for her baby girl!” So I did. 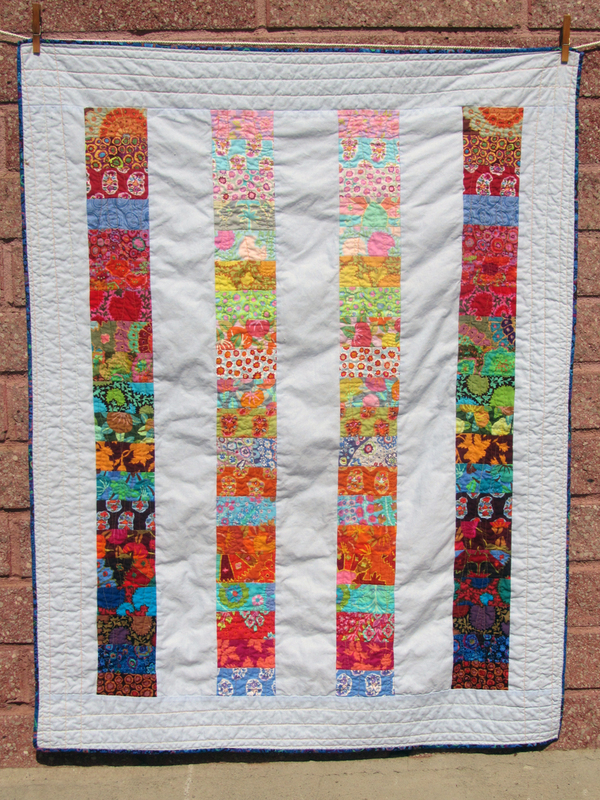 The fabrics in the quilt were from a custom hand cut charm square pack that I purchased from one of my favorite etsy sellers, Monica; all the fabrics are by Kaffe Fassett. I purchased the pale blue solid fabric from a local shop.. unfortunately, I couldn’t tell you who made it. Admittedly, I was actually surprised at the fact that I purchased the charm pack.. it’s typically not really something I’d go for, and this quilt was the only time that I ever purchased fabrics that don’t fall under the ‘modern’ category. I think I was just drawn to the rich variety of prints and color, and how well they go together. I arranged the fabrics by value.. that is to say lightest to darkest. I then cut the squares in half, and then sewed them in strips. I eventually settled on putting the two light strips in the middle with the darker ones on the outside. 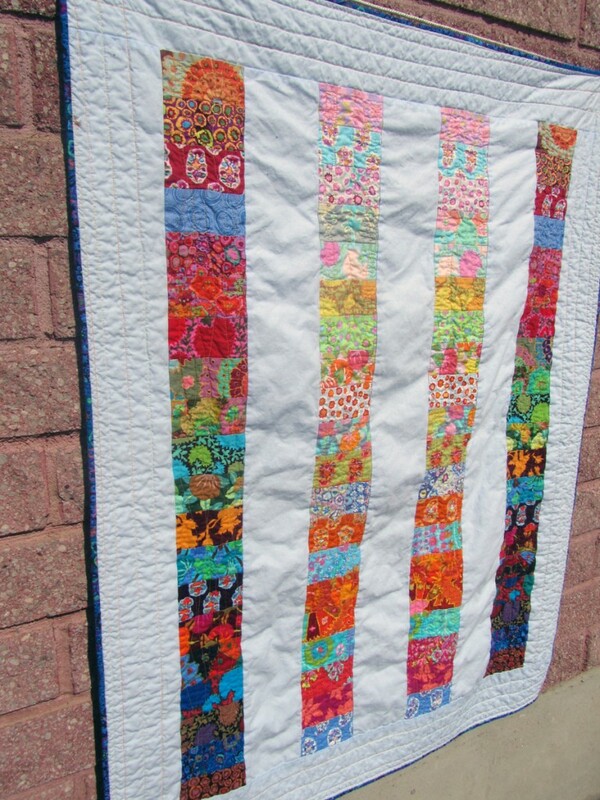 A side shot of the quilt. 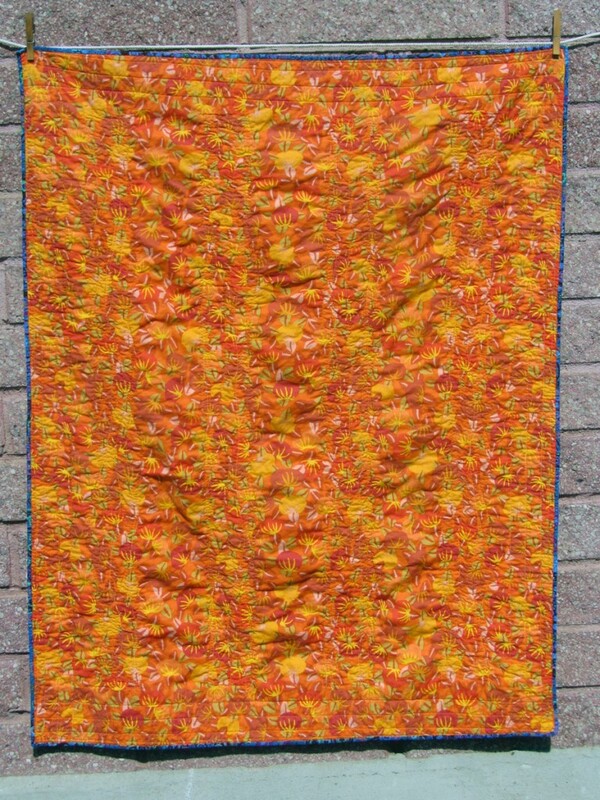 I did the quilting with a variegated thread in tones of orange and yellows by Gutermann. I picked the color since I wanted something that would pop on the front, but blend in the back. The back and the binding are also Kaffe prints. I mailed it off at the end of September, and then the quilt arrived on October 3rd. Good timing too, because the little princess this belongs to arrived just 4 days later! Hopefully this quilt will get worn with lots of love and snuggles over the next years. Previous Post Previous post: Washi, Washi! Next Post Next post: Hello 2013!